I'm getting really stoked on the website! While going through old footage in preparation for a historical ASRA documentary film I've started producing, I came across a "crash tape" I made back in the day. The video quality isn't great - 2nd or 3rd generation VHS footage - but what the hey! I did what I could and spruced it up a bit with some classic RFTC for your viewing and listening enjoyment. Working on this got me thinking... whether it's surfing or road racing, accidents are bound to happen. Solo get-offs are bad enough (hopefully there's a harmless lesson learned), but when a second person gets involved, getting things untangled and parsing out the blame can add a whole new set of variables to the equation. A short video of crash highlights from the American Scooter Racing Association (ASRA), with Lambrettas and Vespas competing on the racetrack. This came to mind for me personally last week while surfing Tourmo. I had already been out for a good hour or hour and a half at the Pumphouse when I decided to paddle over to Old Man's for a last few waves. It was waist to chest high on the sets - nothing huge by any stretch, but punchy fun waves nonetheless for the longboard. By the time I had grabbed a few lefts and rights I was about ready to call it a day because I had somewhere to be. Soon a nice wave came through just north of the culvert and little inside of where the outer set waves were breaking. It wasn't the biggest wave of the day, but it had nice shape. It was kind of a double peak, and as I sized up the opportunity to go right on the peak coming at me, I saw one of SoCal's best longboarders (and a Tourmo regular) taking off at the other peak. I wasn't sure at first if he was going left or right, so I made the drop and took off right with the hope he was going left - and the plan of getting out early if he went right. He went right, but there was quite a bit of room between us, so I held on for a little while. What happened next isn't quite clear in my mind, but I think it went something like this... All that room I thought I had quickly vanished as he connected the two sections - and knowing him probably fully committed on the nose, at warp speed. Meanwhile, though I'm sensing it's getting to be about time to get out of his way, I don't yet realize the urgency of situation. Rather than kick out the back, I stuff the nose into the lip in lazy version of a Standing Island Pullout. This maneuver swung the tail of my board out into his path, and all I remember next is chaos - boards banging, water splashing everywhere, wax getting swapped, and arms and legs flailing everywhere. I surface to a barrage of swearing that can be heard for 100 yards in every direction. Tension fills the air. Not a good situation... nope. And it had been such a fun day to that point! Heartfelt apologies quickly ensued, cooler heads eventually prevailed, and things are fine now. Lesson learned. 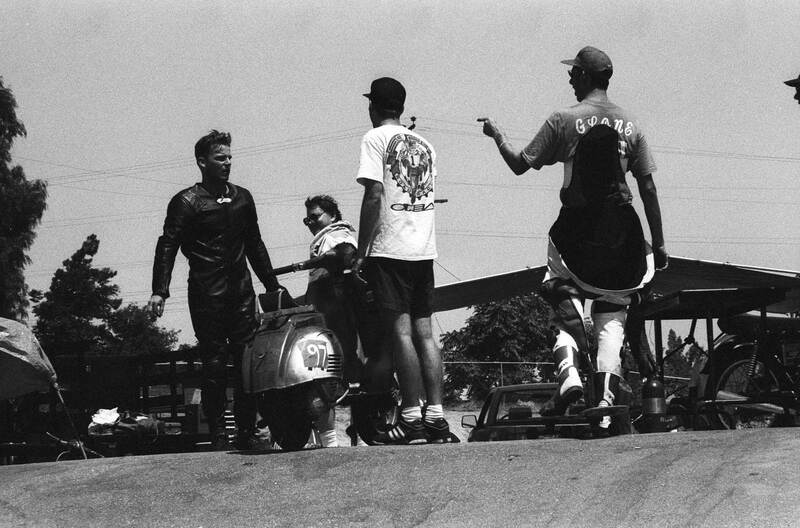 Glen Gorham (far right) and Mic Koslov having a 'discussion' during an ASRA event at Adams Kart Track. I bust a gut every time I look at this photo! Been there, done that, Koslov! Prove you're human: Which do you fancy? No Spam, no pineapple, no problema!